Not interested in Surfside Beach ? Please choose a different community. Every 3rd Saturday of each month we distribute free groceries, we also provide help with social services, free lunch, free haircuts, a children's craft table and used sheets donated from local hotels. For those in need, please come and let us help your family. For those who have the calling and time, please join us as a volunteer. With a ministry the size of New Beginnings we will always need help, help from within our Parish family and help from within the community. Everyone is welcome and there is something for everyone to do. Below you will find the various jobs and a description of them. You may sign up right here via email (links included) and you will be contacted. Sign ups will be on a first come first serve basis. You will need to sign up in order to work. Thank you all for your dedication and hard work. We are also looking for an individual to chair this committee. Work day of event 12:30PM-2:30 PM. 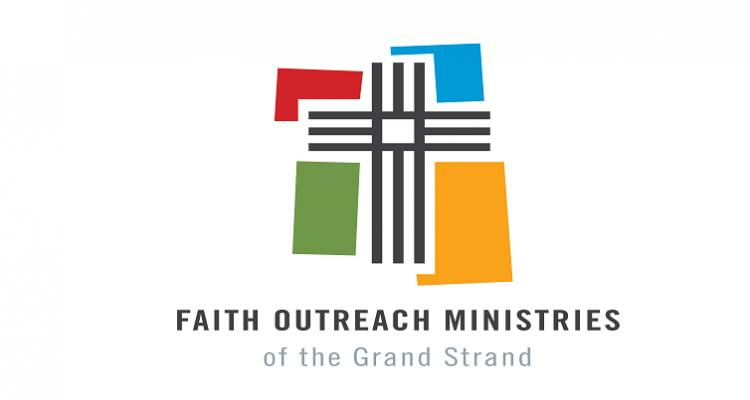 Faith Outreach Ministries of the Grand Strand, a non-profit organization located in South Carolina, is a Christian ministry that strives to improve and sustain the quality of life in the Grand Strand. Formed in the Fall of 2017, it has taken over responsibility for the ever-growing New Beginnings Monthly Food Distribution started in 2011. Each month, New Beginnings provides free groceries and lunch to approximately 200 families. The need keeps growing for food, nutrition, social services and prayer. Faith Outreach Ministries, and all other ministries under Faith Outreach Ministries, is a fully volunteer operated ministry. During the past 7 years, New Beginnings has distributed over 632,896 lbs. of food and has assisted clients in finding other sources of outreach to fill their needs. We serve children, seniors, families and Veterans. No one is turned away. 1. Our first distribution took place on the 3rd Saturday of the month in March, 2011.
distribution site for United Way's Day of Caring. We had two food distributions in one weekend and again you, the volunteers,came through. social services, free lunch, free haircuts, a children's craft table and used sheets donated from local hotels.